Built to support the Mathematics Florida Standards (MAFS), Math Techbook is a breakthrough digital textbook that engages students in real-world problems while building lasting proficiency. This site includes the state requirements needed for the 2018 Florida Instructional Materials review in Mathematics. Below you will find the following information for review: UDL forms, correlation documents, along with a reviewer’s guide, and videos. The streamlined, responsive design of Math Techbook provides a consistent experience, accessible from any device, in any instructional setting. Math Techbook in Action: Any Device. Any Classroom. 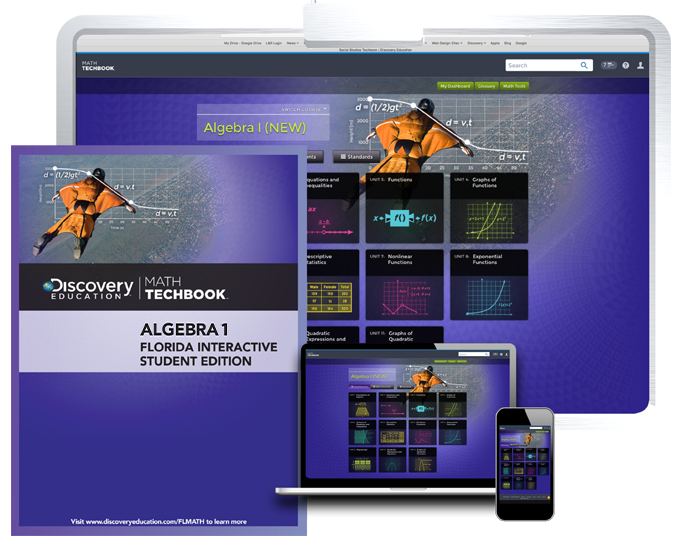 Districts that license Math Techbook for their students gain access to all grades and courses available within the series, providing even more value and flexibility for teachers and students. Each digital course is accompanied by a print companion, the Interactive Student Edition and corresponding teacher’s guide. Please complete the form below to request access to your evaluator edition. Upon completion, you will be sent a login that will allow you to review the content and functionality of Math Techbook for Florida. The biggest distinguishing factor about Math Techbook is how it saves teachers time. It allows them to receive and respond to student answers instantaneously, better assess student performance, and identify if someone is falling behind.